Reach for this LSI Citadel 1911 Semi-automatic .45 ACP Handgun. It's easy to shoot and offers unmatched reliability and accuracy without breaking the bank. So whether it's for plinking cans, concealed carry or self defense, you'll love the look, feel and performance of this LSI Citadel 1911 Handgun. LSI Citadel 1911, Semi-Automatic, .45 ACP, 5 Barrel, 8 Rounds is rated 5.0 out of 5 by 5. 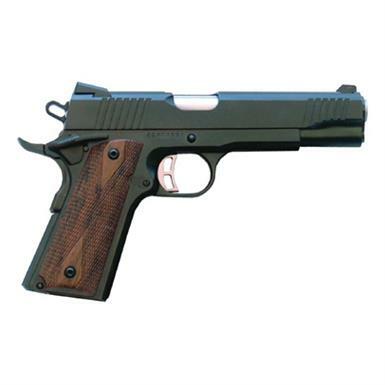 Rated 5 out of 5 by ChiMarine from Well-made 1911 for a great price This is my second LSI Citadel 1911. My first was the 9mm, which was one of my favorite pistols to spend the day at the range with. This .45ACP version is even tighter than the 9mm, so much so that it rivals my Colt for accuracy at 15-20 yards. I'm shooting all different brands of ammo to see if the pistol is finicky like people say, but so far (nearly 900 rounds down range) I haven't encountered any problems. This thing eats up anything I feed it. Great gun for a third of the price I paid for my Colt. Rated 5 out of 5 by Ossberg from I own several 1911 Colts, AMT, Para USA, and Ruger. This is my second 1911 Citadell. The precision machined parts are a sign of a quality product. Rated 5 out of 5 by jjack from GREAT GUN just pick the gun up today .i can say i am every happy with the gun. Rated 5 out of 5 by chris z from I had to get 2 of them. every thing you want, fitted very nicely for a price that will make you come back for at lease 1 more. put on a nice pair of custom grips and your done.